While football fans the length and breadth of the country got swept up in transfer deadline day, there was some movement at Sleaford Town. The club strengthened with the signing of Ollie Bean, who has been playing at Lincoln United Under 23s. The 19-year-old will give Town manager Jamie Shaw a range of defensive options. “He can play in a number of positions, either at right-back, centre-half or holding midfield,” said Shaw. Harry Millard, who has made 23 appearances this season, and Ben Greenwood were both picked up by Grantham Town, but will be allowed to turn out for Sleaford when not required by the Gingerbreads, having signed dual registration forms. However, their move may also be affected by a change of manager at Grantham last weekend. 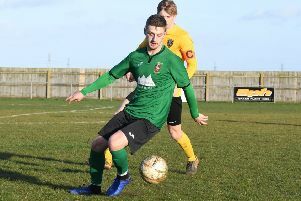 Archie Moyses has also attracted the attentions of a higher-league club with Northern Premier League side Spalding United his next destination, although he can also still add to his 20 appearances for Town this season when available. Goalkeeper Garry Doran has also left Eslaforde Park for local UCL rivals Boston Town. While all but one fixture in the United Counties League Premier was postponed last weekend, Town’s scheduled fixture had already been put back three days to Tuesday. Town were due to travel to Deeping Rangers last night with Rangers busy on Saturday in the FA Vase, fighting for a place in the quarter-finals. But their historic run came to an end with a 3-2 defeat in Devon against Willand Rovers. On Saturday, Town will hit the road again to take on mid-table rivals Harborough Town (kick-off 3pm).